I had no idea of how little I knew about fire safety, or how complicated and complex it is behind the scenes at Las Vegas Fire and Rescue. The evening started with dinner and casual conversation with the team members of Fire Station #1, which is on Bonanza and Fourth Street. They work the weirdest schedule of any that I’ve ever heard of. 24 hour shifts, every other day for 5 days, then 4 solid days off. There’s 3 teams per station rotating thru the same schedule. Which team you’re on determines which days you work. 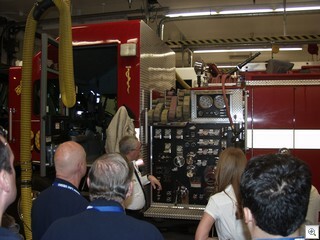 A “hook and ladder” truck has a 7 year life expectancy and costs around $750,000. A “pumper” lasts for 4 years, and costs 350k. Ambulances are only good for 3 years before they start falling apart. One of the major achievements of the last several years is that EVERY type of equipment is identical at every fire station. 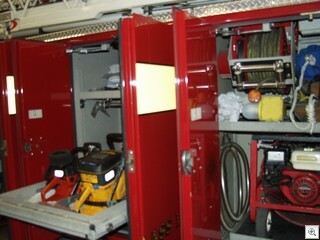 That has provided huge cost savings to the city in training time, parts and maintenance, and safety for the firefighters. I had never been up close to a hook and ladder truck before. It’s truly an amazing piece of machinery. I got to crawl around in a pump truck last month at the National Night Out event, but this was a special treat. 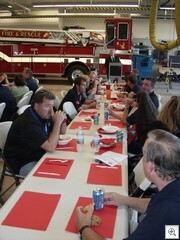 Similar to the Citizens Leadership Academy, there’s also a “citizens fire academy”, which starts in February. Fire prevention speakers are available for ANY school, club, organization, or business. All the different education and free services are described here. The only disappointment was that it was all on one floor, so there’s no pole for them to slide down. The emphasis for this years Fire Prevention Week is on fire drills for the home. The invention of the SMOKE DETECTOR has reduced the number of fire deaths in the US from 80,000 per year to less than 4000. City code for ALL buildings since 1989 calls for smoke detectors in every sleeping space, the hallway, and on every floor. Sadly, it’s one of the things I don’t see quite often in our Vintage Vegas homes. Tim Szymanski, the director of Public Information for LVFR, who guided our tour was especially insistant that EVERY home should have a fire drill regularly, should change the batteries yearly, and test EVERY smoke detector at least twice a year. We also visited the 911 call center, and Metro’s Downtown Area Command, but I’ll do a separate report on those experiences tomorrow.